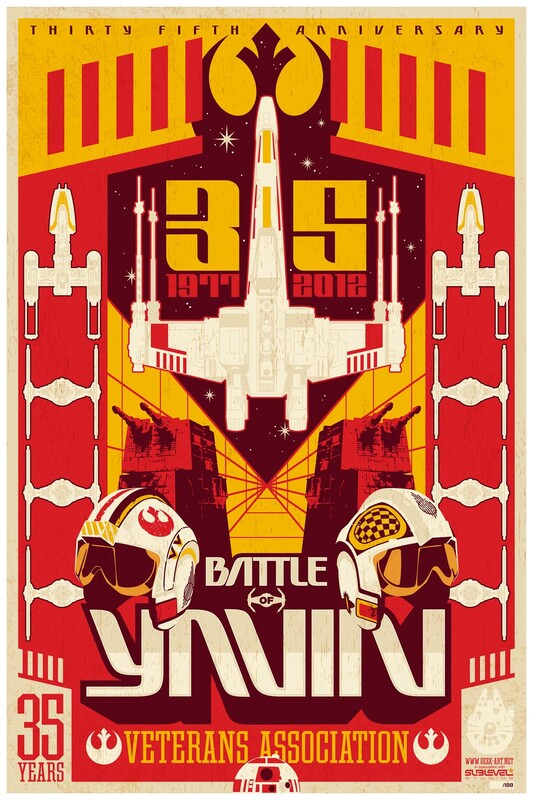 Seems everyone is starting to celebrate 35 Years of Star Wars, Mark Daniels (aka Sublevel Studios) designed this stunning Star Wars, Battle of Yavin Veterans Association Poster. Unfortunately there’s a downside, he was going to sell the posters on his website, but was forbidden by Lucasfilm to do so. Read Lucasfilm’s response below on how they (rightfully) protect their intellectual property rights. Lucasfilm Ltd. and its affiliated and related entities (collectively « Lucasfilm ») are the exclusive owners of all rights in and to the STAR WARS major motion pictures and any other STAR WARS film or property. 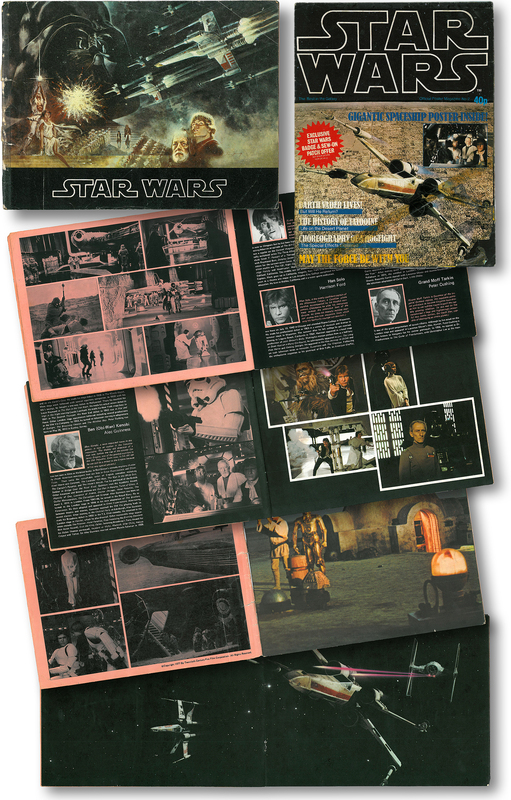 Those properties and the characters and unique elements which appear therein (the « STAR WARS Copyrights and Trademarks ») are protected by the copyright and trademark laws of the United States and other nations. We note that STAR WARS Copyrights and Trademarks are being posted and distributed on the above website without Lucasfilm’s authorization (« Unauthorized Item »). This unauthorized use of STAR WARS Copyrights and Trademarks constitutes copyright infringement, trademark infringement and unfair competition. By this letter, we request that you immediately suspend and/or disable the account of the above website and/or that you immediately remove the Unauthorized Items from the above website. We further request written assurance that you will comply with this demand. Lucasfilm is the exclusive owner of all relevant rights in and to the Star Wars Films. We have a good faith belief that any items falling into the categories identified above infringe Lucasfilm’s copyrights and other intellectual property rights, and are not authorized by Lucasfilm or its agents. Pursuant to the DMCA, we have a good faith belief that any items falling into the categories identified above infringe Lucasfilm’s copyrights and other intellectual property rights, and are not authorized by Lucasfilm or its agents. I am authorized to act on Lucasfilm’s behalf regarding these matters. The information provided in this communication is accurate to the best of my knowledge and is provided under penalty of perjury. Thank you for your cooperation. Nothing in this letter shall be construed as a waiver or relinquishment of any right or remedy possessed by Lucasfilm or any other affected party, all of which are expressly reserved. What if your old Marvel and DC comic covers were animated? Well here’s a few classic comic book covers that have received a little animated GIF treatment. The comics included here are Justice League’s The Wheel Of Misfortune, Spider-Man’s Final Chapter, Batman’s The Dark Knight Returns,(CLASSIC) and Iron Man’s Demon In A Bottle, I think these awesome animated comic covers are a little twee, but nice. Check them out below and tell me what you think! The were created by Kerry Callen. 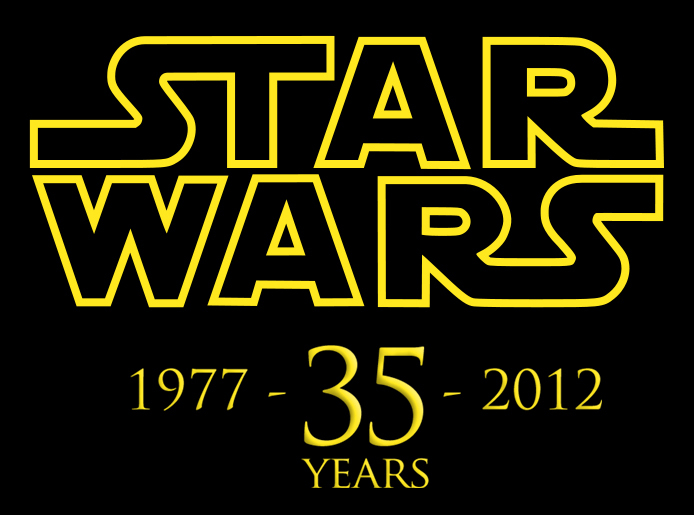 It’s hard to believe 2012 heralds the 35th year of Star Wars …’how time flies’. For me, there’s so much I could say about my ‘favourite’ film, but instead I thought I’d reminisce about the day I went to see Star Wars for the very first time. I first heard about the film when a young 10-year-old Neil Stringer told me about this amazing picture he’d seen on our way home from School, but this wasn’t May 1977 (25th) when it was first released in the United States, but more like early 78, as the UK premier wasn’t actually until Boxing Day 1977, a full 7 months later in two West End cinemas, the Leicester Square Theatre and the Dominion, Tottenham Court Road, where it took a record-breaking £117,690 in its first week. Star Wars continued to play exclusively at these two cinemas for over the next four weeks, were it instantly became the hottest ticket in town, ticket-touts where reportedly selling £2.20 tickets for £30 quid. But on the 29th January it finally opened in Leeds. For me I can’t remember the precise date I went to see it, although it was a Saturday in February at the Odeon Cinema on The Headrow in Leeds. It wasn’t a family outing, but instead a trip out with my good friend Mark Adams and his Granddad. 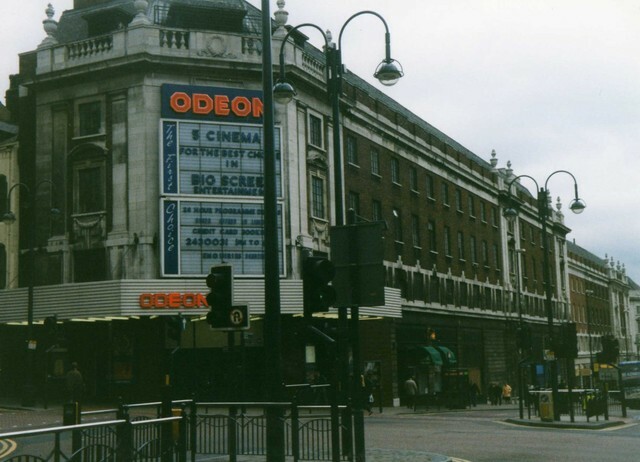 The Odeon was a three screen cinema in those early days, before it was later split into a 5 screens, this meant the main screen 1 auditorium was ‘HUGE’…well, it felt huge to a small 11-year-old lad like me. So I sat down proudly holding my first swag of Star Wars keepsakes while watching Pearl & Dean as I awaited the film to start. It was at this point the curtains would close while you could hear the tiny motors widening the screen size from its 1/3rd size to full 70mm capacity. One of the amazing qualities of this amphitheatre of film was the sound and its sheer volume (something the Health & Safety sphincter police must have curtailed in later years) It was this sound that had a physical impact on me, because you could feel the noise of the opening Star Destroyer approaching, vibrating through your body before it appeared on-screen, and when it did appear…HOLY WOW!! It just went on and on and on, that thing was HUGE. Even at the very end of the film your spacial senses were tested as well, when Luke’s X-Wing swooped into the Death Star trench you wobbled from left to right in the same you do at an IMAX screening today. From the moment the credit finally rolled up I was hooked…FOR LIFE…and subsequently went to see it more time than I can remember (25 Geekish times I think) even to this day I love to watch it and still don’t get bored. The new Blu-Ray gave me another excuse to have a family Star Wars viewing night, one which we have each year. 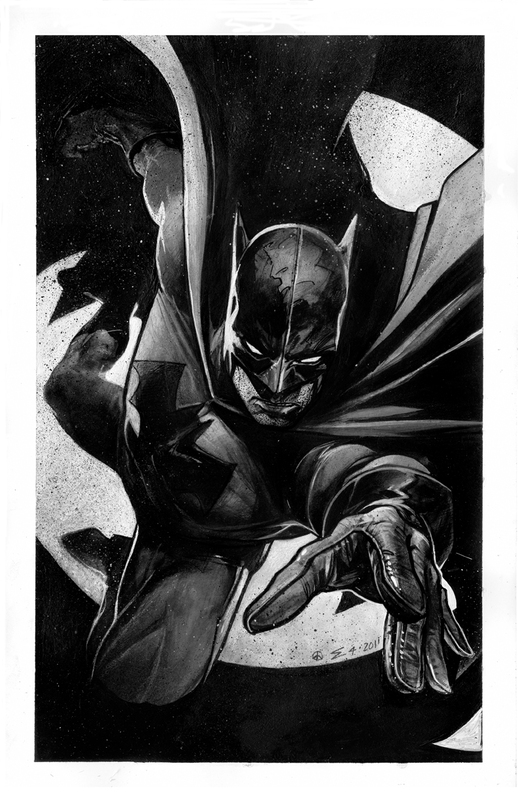 Brilliant comic book artist Eddy Newell has created these awesome Black & White Batman Art. 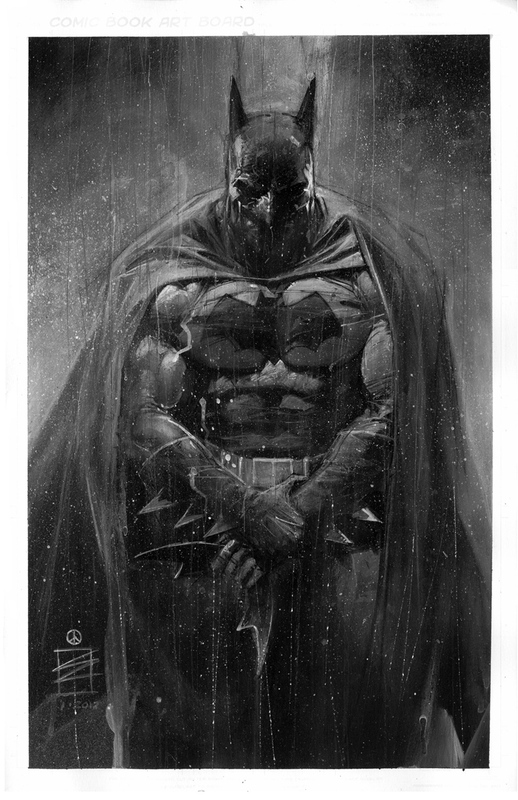 Eddy has been a comic-book artist for many different publishers, including DC, Marvel, and Image Comics, since 1989. He is best known for his work on DC Comics BLACK LIGHTNING, and various Moonstone Books comics and covers, which include art for the WEREWOLF THE APOCALYPSE series of books. Eddy is currently at work on the CAMELOT FOREVER mini-series for Skystorm Studio, and a new SABRE story for Desperado Publishing. As a treat on my birthday we travelled to the picturesque ‘and’ unspoilt seaside town of Filey on Yorkshire’s East coast. It was a trip accompanied by my lovely wife, two gorgeous daughters (The Girlies) and the dog, for a long walk along its golden beach. I’ve been visiting Filey since I was little boy, so I know it like the ‘back of my hand’ but this day there was a welcome surprise by artist, fabricator and sculptor Ray Lonsdale in the order of a stunning 12ft high steel ‘Core10’ sculpture called A High Tide in Short Wellies, depicting a tall fisherman. 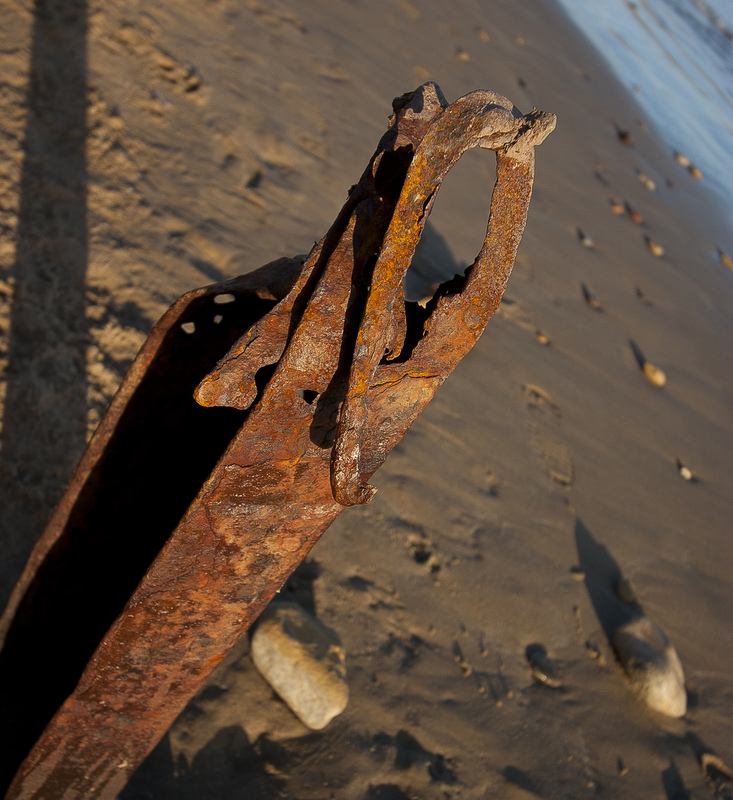 The installation is sat on the edge of Filey Brigg looking out to sea, as if he’s a twisted piece of steel sticking out of the alluvial sands eroded by time. Ray seems to have expertly used the steel to imitate the textures of the fisherman’s clothing, from his woollen hat down to his huge Wellington boots. 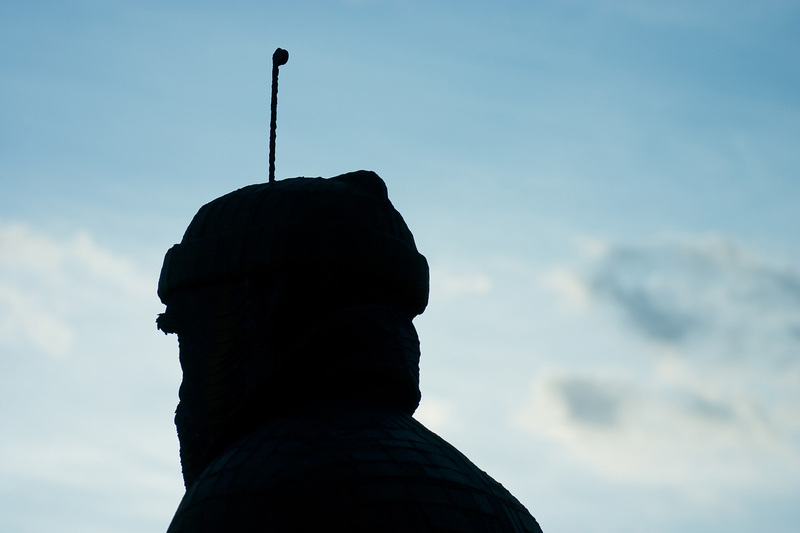 The fisherman also proudly clasps a fishing rod which stands higher than the figure himself. 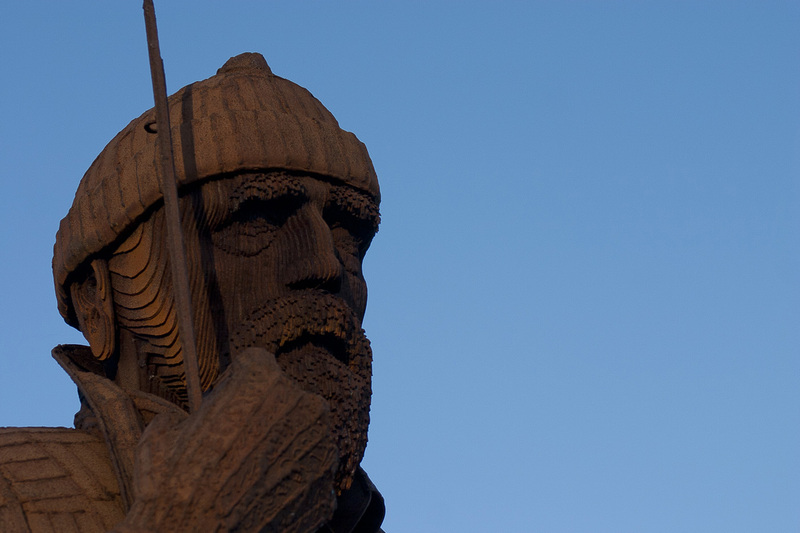 His bearded face is beautifully made up from lots of vertical stacked cut steel plates. All of this detail is truly exquisite, right down to the Cod folded in newspaper at his feet with a tenacious rat trying to steal his prized catch. I can imagine the eminence of this piece been lost in the hustle-and-bustle of places like Whitby & Scarborough, but in the solitude of Filey Brigg it seems to elevate the prominence of this twelve-foot bloke has he gazes out over the Bay. The whole piece is supposed to be a metaphor for the deterioration of the fishing stocks, and on the base of this sculpture sits a plaque with a poignant poem about The Decline of British Sea Power. That’s it for me, I’ll see you later. Then underneath this some fisherman wrote. So sat with a perfect Bakers milky coffee (Best Coffee in the World in my honest opinion) I admired this gargantuan Core10 fisherman as the sun went down behind him on this warm sunny winter Birthday of mine. The sculpture is currently on loan to Filey for the next few months, unless a willing buyer can make it a permanent installation. Judging by the crowds he was drawing in, it would make great visitor attraction for the Summer of 2012. 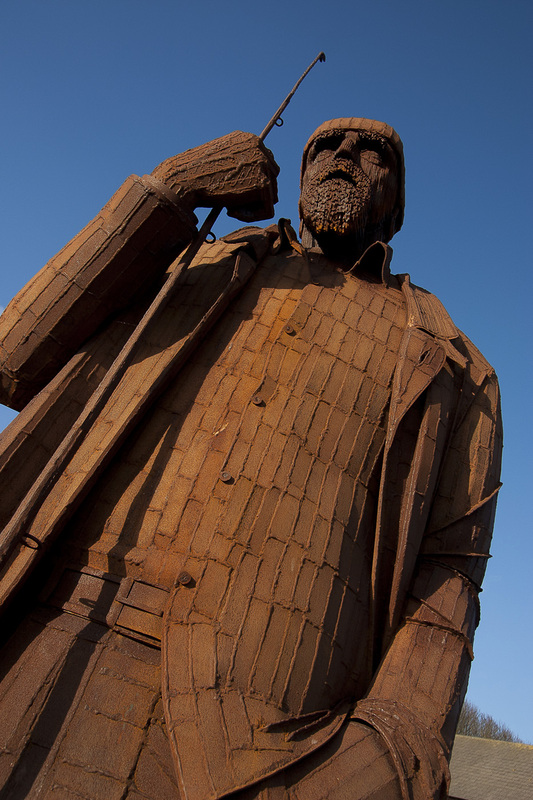 Great news, Filey’s Fisherman Friend is here to stay! Thanks to philanthropic pensioner Maureen Robinson for pledging to buy the man of steel sculpture for the town – her second major investment in public art in a matter of weeks. 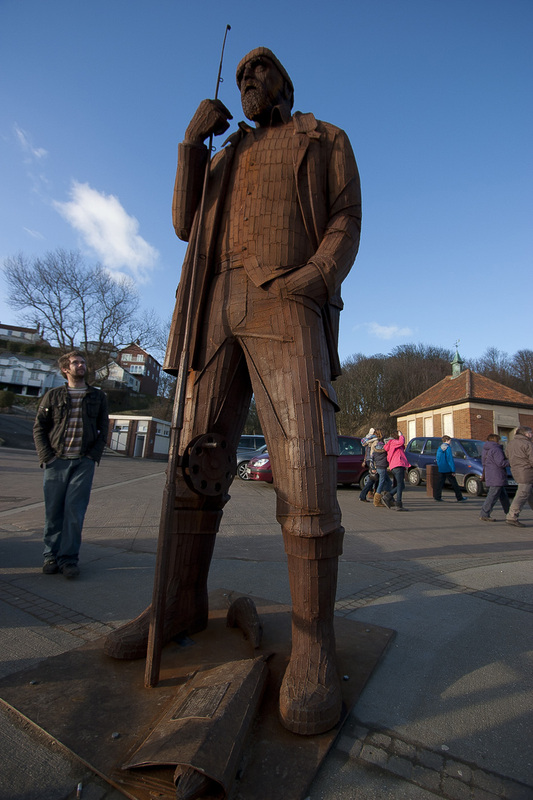 “Having acquired Ray Lonsdale’s remarkable sculpture of ‘Freddie Gilroy’ as a tourist attraction for Scarborough, it seemed fitting to have the ‘fisherman’ for the fishing resort of Filey. I’ve had a lifelong passion for natural history, especially marine biology. Countless hours have been spent at Scarborough, Filey Brigg and other rocky shores at low tide (in short wellies!) seeking fauna and algae. What finer sculpture for Filey, than ‘A High Tide in Short Wellies’. Michael and I love life’s simple pleasures. Having written more than 2,000 features related to wildlife for the Scarborough Evening News, I’ve also devised 970 walks within a 25 mile radius of Scarborough. Michael and our dog have accompanied me on every occasion. Filey has featured in many of our pursuits, including circular walks in the gorgeous gardens at Filey Dams and County Park, bird watching, and visiting the town’s most interesting and comprehensive museum. When you’ve achieved three score years and ten, I feel its time to give something back to the local community. We have no family, therefore a sculpture project for future generations and visitors from far and wide to enjoy, seemed a dream come true.